In promising news, the latest figures from the Clean Energy Council (CEC) have shown that renewable energy supplied a record amount of Australia's electricity in 2012, amounting to 13.14 per cent. The 2012 Clean Energy Australia Report produced by the CEC has shown that renewable energies such as wind, solar power and bioenergy are really starting to make a major difference to how Australians produce and consume electricity. "The clean energy industry contributed $4.2 billion in investment and approximately 24,300 jobs to the Australian economy in 2012," said David Green, chief executive of the CEC. While the cost of traditional fossil fuels has been rising, cleaner forms of energy have been getting cheaper and more accessible. "Recently the level of power generation from coal has been declining, while Australia’s 20 per cent Renewable Energy Target has been driving the increased use of technologies such as wind, solar, hydro and bioenergy. Solid rainfall in key hydro catchments in the first half of 2012 was also a factor," said Mr Green. Australia has been reaching a lot of renewable records lately. Mr Green mentioned that the nation installed one million solar power systems and hit milestones for the wind power business. Today, 62 wind farms power over one million homes across the country. As electricity bills rise for the everyday consumer, many households have taken steps to reduce their costs. Switching to cleaner forms of energy has turned out to be an attractive option for many of these individuals. 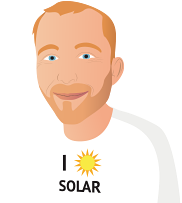 "Businesses and households are increasingly turning to energy smart appliances, and more than 800,000 solar hot water systems have now been installed as well," noted Mr Green. Clean Energy Council Chair and AGL chief executive Michael Fraser asserted his hope that due to such progress, the Renewable Energy Target goal – to source 20 per cent of Australia's electricity from renewable sources by 2020 – may be reached. Hydropower continues its reign as the country's biggest renewable energy producer, but wind power and solar power are also creeping up their share. Still, some unease remains about the certainty of Australia's renewable energy, as the government's proposed cuts to key clean energy player the Australian Renewable Energy Agency (ARENA) may cast a shadow of doubt over the industry's security for investors. Whether the cuts are implemented or not and what kind of impact this will have on the renewables industry in Australia remains to be seen, for now.